In 1668, Hans Conrad Gyger submitted an outstanding cartographic masterpiece to the government of Zurich. His map of the Zurich area took 38 years to survey and paint, and is considered as one of the most beautiful cartographic works of that time. Because of its high military importance the map was kept secret, and, unfortunately, had no influence on contemporary cartography. 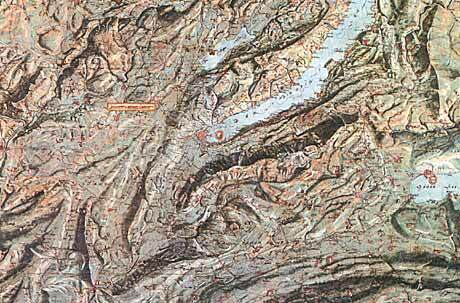 Not until 200 years later were shaded relief maps of comparable quality and beauty produced. Gyger depicted the topography in a naturalistic manner with illumination emanating from the southwest. The map is east-oriented. It was drawn and painted with gouache and pen. The original map is stored at the “Staatsarchiv des Kantons Zürich”.